On August 2, 2007, at 3:21 am UTC (August 1 at 7:21 pm ADT), a strong earthquake, magnitude 6.7, occurred in the Andreanof Islands region of the Aleutian Islands (red star on the above map). The event was situated 86 kilometers (53 miles) east-southeast of Amchitka and 243 km (152 miles) west-southwest of Adak. This earthquake is the largest to occur in the region since the magnitude 6.6 event on July 8, 2006 (white star on the map).The AEIC located about 270 aftershocks with magnitudes 1.5 and greater through the end of the month (crosses). Of these, fifteen had magnitudes 4.0 and greater. The largest aftershock (M5.3) occurred 3 hours after the mainshock. We received no reports of anyone feeling this earthquake. 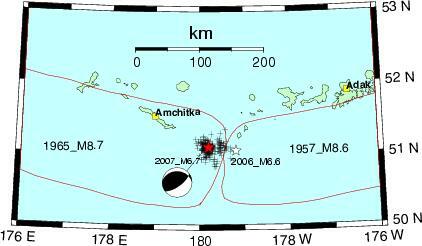 The August 2 earthquake occurred in the area separating the rupture zones of the 1965 M8.7 Rat Islands earthquake to the west and the 1957 M8.6 Andreanof Islands earthquake to the east (approximate extent of the rupture zones is shown in red). The westernmost area of the 1957 fault zone was reruptured repeatedly in the 1986 M8.0 and 1996 M7.9 earthquakes . The eastern portion of the 1965 fault zone was reruptured recently in the M7.7 earthquake on November 17, 2003. While the June 2006 sequence of earthquakes was located near the westernmost end of the 1957 rupture zone, the current event was located across the rupture zone boundary at the easternmost end of the 1965 rupture. All these events ruptured the boundary between the subducting Pacific and overriding North American plates. Within the past ten years, the region shown on the map had on average two magnitude 6 or greater events per year. The Aleutian megathrust, where the two plates are being forced directly into one another, is one of the world's most active seismic zones.